Drawing students from four very racially and socioeconomically disparate communities in the northeast corner of Rhode Island, Blackstone Valley Prep uses diversity as both its structuring principle and strongest asset. Its dedication to inclusion has led it to do away with tracking, placing nearly all students in the same classes and curriculum; and it has committed itself to developing a restorative justice framework for addressing misbehavior as well as rigorous cultural training for all of its staff. Blackstone Valley Prep has developed a culturally responsive curriculum and is fostering diversity among staff, but it is still working to meaningfully connect parents from diverse backgrounds, which is a continuing challenge. This case study is part of The Century Foundation’s project on charter school diversity, funded by The Walton Family Foundation. Kiana Cardenas began attending Rhode Island’s Blackstone Valley Prep as a freshman after her mother, Monica Goncalves, entered her name in the charter school’s lottery without telling her. Her mom was drawn to the high expectations of the intentionally diverse charter network in Rhode Island, where students come from two predominantly lower-income cities, Central Falls and Pawtucket, and two more affluent suburban towns, Cumberland and Lincoln. Goncalves had also wanted to avoid sending her daughter to Pawtucket’s Tolman High School, the school she herself attended before dropping out when she became pregnant with Kiana at age sixteen. Kiana initially felt unprepared for Blackstone Valley Prep (BVP)’s rigor. But she soon learned that her new peers were her greatest resource and support system. BVP keeps a laser focus on college as the goal, from kindergarten through senior year; every classroom is named after a different university. Unlike most other high-performing charter networks, BVP has an added dimension of being “diverse-by-design.” The network fosters an environment in which students from disparate backgrounds learn with and from each other in classes that are not tracked. All students wear uniforms—which can be donated, discounted, and aligned to a student’s gender identity—as an equalizing strategy. Through the network’s culturally responsive curriculum, students are exposed to texts representing a variety of viewpoints and are encouraged to discuss people’s differences. Through professional development, teachers are taught to become aware of their own biases and structural inequities and to elevate student voices over their own. Yet, while the network has found meaningful ways to bring its students together, it still struggles in bridging the parent divide, and some of its suburban families are leaving to go to other middle and high schools. Read more about diverse charters schools from The Century Foundation below. Blackstone Valley Prep opened in 2009 with seventy-six kindergarteners, and has since grown to 1,800 students across three elementary schools, two middle schools, and one high school. The network’s charter allows it to grow to nearly 2,400 students. BVP was Rhode Island’s first “mayoral academy,” a special type of regional charter school written into state law in 2008 and overseen by a board of mayors representing the communities where its students live. The new charter structure was part of the state’s strategy in its successful Race to the Top application. Daniel McKee, then-mayor of Cumberland, one of the more affluent of the four communities, led the effort to create the new model after being tapped by the Rhode Island Foundation to look at a regional approach. He drew inspiration from his experience working with youth from across the region as a basketball coach. His teams often “looked like a United Nations,” he says, with players hailing from diverse socioeconomic and racial backgrounds. Due to this diversity, he says, there was initially conflict and mistrust; over time, however, the players developed a real support system. Besides its diversity, the network’s vision included high levels of autonomy—bypassing laws requiring teacher compensation, hiring, and unionization. It was not an easy sell to many locals and state legislators. “We have jumped over more hurdles than anyone,” says McKee, who is now Rhode Island’s lieutenant governor. Many locals frowned upon the non-unionized staff and believed that charter schools took money from traditional public schools. Because of the political ramifications of supporting the network, many local politicians eschewed involvement. Today, McKee says, the network is still fighting an uphill battle in this regard. This trickles down to BVP students and families, he says, who are sometimes intimidated on soccer fields by other families who accuse them of “stealing” from their own kids. Blackstone Valley Prep’s model intentionally draws its district borders to integrate its schools. Though the network’s boundaries span only an area of about ten miles by four miles in the state’s northeast corner, its four communities—Lincoln, Cumberland, Central Falls, and Pawtucket—are economically stratified. Central Falls, for instance, is predominantly Latinx and low-income; residents’ median household income is $28,9003 and median home value is $164,000.4 Lincoln, on the other hand, is predominantly white; its median household income is $65,6005 and the median home value was roughly $304,000. Chiappetta was, at first, wary about working with more affluent students from the suburban towns after spending his educational career up to that point focused solely on low-income students in high-poverty areas in New York City and Providence. But a mentor, who was a superintendent of Central Falls, convinced him of the importance of integrated schools. “She says, ‘The most powerful thing you can do for my kids in Central Falls is put them in a seat next to a kid from Cumberland and Lincoln, and the most powerful thing you can do for a kid in Lincoln or Cumberland is to put them in a seat next to a kid from Central Falls,’” Chiappetta recounts. Many parents in Cumberland and Lincoln, however, do not necessarily agree, and the network’s student body, at this point, is predominantly low-income. BVP’s enrollment lottery is designed to ensure both that its four sending districts are represented proportionally—thus ensuring racial diversity—as well as that a significant portion of students come from lower-income families. Half of the students across the network are Latinx, 36 percent are white, and 11 percent are black. BVP aims to give at least 50 percent of available seats to students that qualify for free or reduced-price lunch6 (the network presently exceeds that, with nearly 68 percent of the network’s students qualifying for free or reduced lunch). Though the network’s student body has increasingly tilted low-income, school officials have not discussed weighting the application process to favor middle-class students, according to Vanessa Douyon, the BVP’s director of strategy. The model, however, is predicated on having a mix of students with a range of needs. Guidance counselors and other support staff can often offer more assistance to those with higher needs when they are not exclusively serving high-needs students, believes Jonathon Acosta, a former middle school math teacher and dean of culture at BVP, who now serves on Central Falls’ city council and is a PhD candidate in sociology at Brown. When it comes to recruitment efforts, the network tries to ensure equity, so that families of all backgrounds can find out about the schools. At the same, the network wants to avoid having too people many apply, which would dramatically decrease the likelihood of being selected, explains Douyon. For outreach, the network ensures that its website is updated, sends out reminders and announcements through social media, and hosts several elementary and high-school open houses. BVP also takes out ads in local newspapers and provides current families with info cards to give their family and friends. Nearly 40 percent of the network’s students come from Pawtucket, which has the state’s third highest population of low-income students and is the only district that has none of the network’s schools within its boundaries. Nearly 28 percent of students come from Central Falls, which only recently emerged from municipal bankruptcy and is home to one BVP middle school. Roughly 22.5 percent come from Cumberland, where two of the network’s elementary schools and its high school are located. Lastly, about 11 percent of students are from Lincoln, home to a co-located elementary and middle school. That elementary school is planning to relocate to the north part of Cumberland, which may make it more convenient to some Cumberland and Lincoln families, but farther from Pawtucket and Central Falls. As it stands, BVP spends more money in Lincoln trying to recruit students than it does in the other districts, and while the network strives to site its schools intentionally, the location often ends up being dictated by building or land availability and price, school officials noted. Free bussing is provided to all students, who can be picked up and dropped off at central locations. Though BVP “doesn’t want students’ ZIP codes to define them,” according to Chiappetta, the network has learned that the locations of its schools’ ZIP codes sometimes do define parent perceptions of the network. When Blackstone Valley Prep opened its first middle school—after a $5-million renovation of a former Catholic school in Central Falls roughly 700 yards from the town line—the school began losing some of its suburban families. The school lacks a gymnasium and ballfields, so it uses a public park with fields four blocks away that the Catholic school had used. The school lacks a gymnasium and ballfields, so it uses a public park with fields four blocks away that the Catholic school had used. This concerned some suburban parents, including one who went to the local precinct to get data on crimes near the fields and photographed the park’s litter and the inside of its portable toilet to raise concerns about safety and cleanliness, Chiappetta says. The fact that the high school has no track record also made suburban families, who had other options for high performing schools, more hesitant, several staffers noted. They hope the high school’s new 40,000-square-foot building, with its “maker space,” “innovation lab,” gym and ballfields, will help stop the loss. There are other aspects of the network that may turn off more affluent families. There’s less time for extracurriculars because of a longer school day and heavy homework load11—both of which were scaled back this year. (Some staffers said the day was shortened to retain teachers, but others said that the move along with the new homework policy, was to retain suburban families.) The network’s rejection of tracked classes and its inclusion of students with special needs, who may have significant behavioral issues, may also be a factor. The school feels a particular sense of urgency when it comes to narrowing academic achievement gaps between whites and Latinx, since the state’s Latinx–white achievement gap is among the largest in the nation. While BVP students may outperform their district peers, the test scores are still not stellar. The network is trying to address this by using data in real time to help the staff figure out where to devote its resources, explains Stephanie Primiani, BVP’s director of STEM education. For example, in response to the data, one elementary school is piloting “content specialists” for math in third grade. It allows those teachers to dig deeper into math since they are only teaching that subject, Primiani says, but it also means having more children with which to build relationships. BVP students in kindergarten through eighth grade are not tracked. 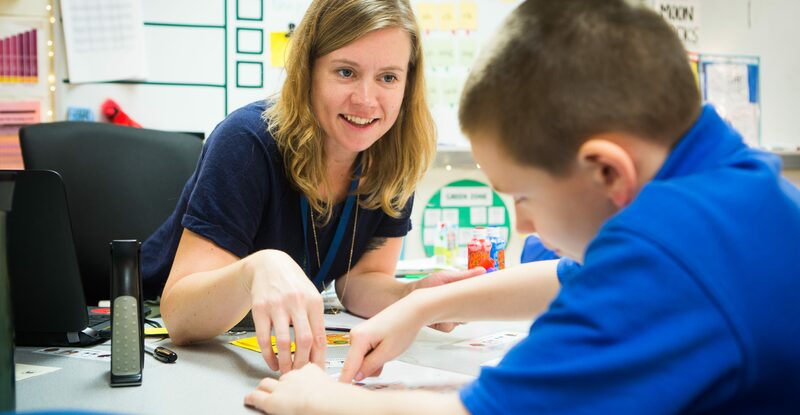 To support differentiation within the classroom, most of the network’s K–8 classrooms are co-taught by a pair of teachers17 (either a special education teacher and general education teacher or two general education teachers). The schools employ different co-teaching models, including parallel teaching, “station” teaching, or having one lead teacher with an assistant. Kourtny DaRocha, a second-grade teacher at a BVP elementary school, says she and her co-teacher “divide and conquer,” with DaRocha working with the struggling students, including those with disabilities or who are English Language Learners. Her co-teacher focuses more on the higher-achieving students. Both teachers then divvy up those falling in the middle. BVP takes its inclusion model seriously, striving to go even further than federal requirements of placing students with disabilities in the least restrictive environment possible, noted Primiani. The school has created a Transitional Learning Center, providing a small classroom setting for students who struggle with social, emotional, and behavioral issues. Even students in this program spend some time in larger classes with students with disabilities and general education students, with the goal of eventually moving into integrated classrooms. While research suggests that differentiation while using one curriculum can reduce the achievement gap without negatively affecting the highest performers, the approach remains contentious.18 The school’s inclusion model has caused some friction among some parents of general education students who want their children in classes separate from those students with disabilities, Chiappetta says. “Within the inclusion model, we are seeing greater levels of trauma-induced behavior. That’s disruptive and challenging and takes away from the learning environment for all kids,” Chiappetta acknowledged. The school’s inclusion model has caused some friction among some parents of general education students who want their children in classes separate from those students with disabilities. Behavioral issues may be magnified in having such large classes that have students with a broad range of needs, even with two teachers. The co-teaching model is financially feasible because BVP has large classes, with roughly twenty-six or twenty-eight students, compared to the twenty to twenty-four students in most schools in the districts of BVP’s four communities, he explained. But Acosta, who taught middle-school math at BVP, would have preferred if he and his co-teacher had their own classes of fourteen students, like elite private schools. “If you had fourteen kids, maximum, to a room, you would kill it,” says Acosta. Cesar Urzua, a BVP junior from Central Falls, believes the program is helping him learn the time management skills he’ll need for college. Unlike his friends who go to public schools in Central Falls, where homework assignments tend to be doled out with specific numbers of pages needing to be read and questions to be answered by the next day, at BVP, students are given assignments, as in a college course, at the beginning of the semester with due dates even weeks away. 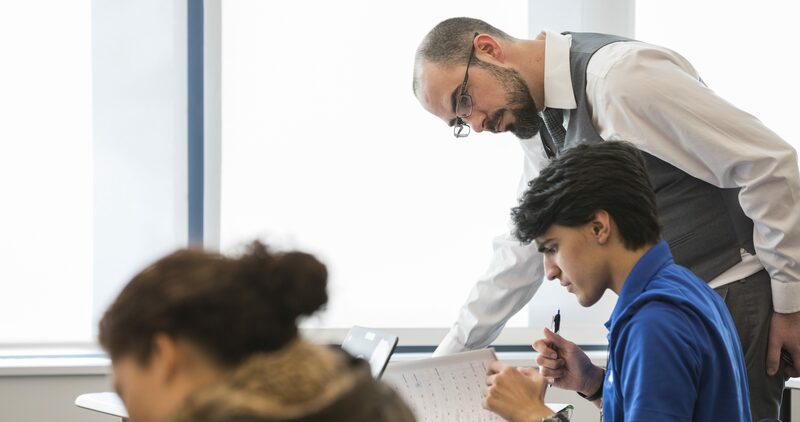 “Every student has an opportunity to learn at their own pace and how they prefer,” he says, noting how students keep track of their assignments, completed on their own timelines, through the tech platform. While Chiappetta is excited about personalized learning, he is also concerned about potential unintended consequences for some students who are truly working alone, at their own pace, and feeling isolated as a result. The network’s professional development addresses bias, stereotypes, and the history of structural racism in the United States, and its rubric to evaluate teachers, administrators, and support staff includes cultural competencies.22 Sarah Anderson, BVP’s chief academic officer, explains that while these issues are admittedly hard to measure, the presence of cultural competencies on its rubric allows the network to have conversations with staff about issues like race and class. BVP is also focusing on these issues in the curriculum itself—and how teachers are interpreting it to make their teaching culturally responsive. Part of that comes from giving more voice to students, who now, for instance, lead their own parent–teacher conferences. For the humanities, the curriculum includes books from diverse authors. Kindergarteners learn to celebrate differences with such titles as I Like Myself and Nappy Hair. First graders read Squanto’s Journey, which tells the story of the first Thanksgiving from a Native American perspective. Second graders read stories about Cinderella from around the world. The school also tries to be intentional about how students use their non-academic time by providing “prompts” to get kids talking and thinking about diversity. In the current charged political climate—where the day after the 2016 presidential election some students wore red “Make America Great Again” baseball caps while others expressed concerns about being deported—the school believes this work is critically important. One Cumberland mother, who is white, was proud that her son wanted to talk with her about what happens if ICE agents approach him and his friends after discussing the topic in school. Another Cumberland mother, whose son is multi-racial, described how he felt much more comfortable about his identity once he joined BVP because he felt more accepted by a diverse group of peers. The schools endeavors to have every family receive a home visit from a teacher by the end of October. They do this in the hopes of aiding teachers build relationships with families and helping them understand who their students are and where they are coming from. The school’s leadership also spends time in the different communities. Chiappetta created a scavenger hunt for BVP’s senior staffers over the summer. He led them to community hotspots that mattered to kids, like playgrounds, basketball courts, libraries, and the Boys and Girls Clubs. He challenged them to find businesses owned by BVP families, as well as other staffers’ homes. Chiappetta has also been intentional about where family events are located, for instance moving the school’s popular 5K race from northern Cumberland to a park in Pawtucket. It is not an easy feat to hire a staff that reflects the diversity of its students, particularly in a state with a teaching force that is 95 percent white. It is not an easy feat to hire a staff that reflects the diversity of its students, particularly in a state with a teaching force that is 95 percent white.23 The network has had some success hiring high-level staffers from its urban districts: one such educator is Osvaldo Jose Marti, head of one of the middle schools, who grew up in Pawtucket, and Stephanie Gonzalez, associate director of partnerships, who grew up in Central Falls. Gonzalez occupies an important outward-facing role for BVP, working on parent engagement and advocacy, as well as connecting students with the larger community beyond BVP through internships and “shadow days” with local professionals. As the network grows and matures, it is rethinking some of its original foundations, including its approaches to discipline, homework, and even how much autonomy it gives to its individual schools. It is trying to give its educators more of a role in shaping their school’s policies, and also trying to improve teacher retention. Meanwhile, the network is continuing to find creative ways to ensure more equal participation among parents from different backgrounds, which is proving a tougher nut to crack than leaders expected. Wandy Henrriquez, a BVP senior who grew up in a public housing development in Pawtucket, credited the school’s long hours and the homework load with keeping him focused on college and off the streets. Ultimately, the network cut the hour off the day to retain staff, Chiappetta says, noting that as the network grows up so does its teaching force: last year, there were thirty-three maternity leaves out of 210 educators. Still, some staffers question whether the school’s performance could be adversely affected by shaving the day by an hour, which was spent mostly on professional development. Many families are drawn to BVP for its strict discipline, but some school leaders feared the approach was not doing much to change behavior, that the same children were repeatedly landing in suspension. Boys of color were disproportionately affected, says middle school principal Marielle Emet, who, like other school leaders, is given a fair amount of autonomy by senior network administrators when it comes to many school policies. She moved toward a model of restorative justice this year, with classes holding “restorative circles” to bring children together to talk about behaviors. She believes that getting students to care about their community is key: they are then more open to thinking about how their behavior affects that community. To get buy-in, Emet enlisted teachers’ help, spending a week with them before the 2017–18 year to craft the new policy, and then convened a parent focus group to get feedback. It is still is a work in progress, she admitted, and the school is devoting most of its monthly professional development to refining the policy. Second grade teacher DeRocha says that her elementary school is also focusing more on social–emotional development, spending the first twenty-five minutes of each morning explicitly teaching social skills and calming strategies like mindfulness, and encouraging kids to talk about their feelings of frustration and anger as well as appropriate ways for them to deal with those feelings. Encouragingly, the school has seen a significant decrease in office referrals for egregious behavior, especially for some students who were challenging the previous year, she says. While the network has created meaningful ways for its students to break down boundaries within the classroom setting, BVP still struggles with bridging the divide between groups of parents, and the voices of more affluent families often drown out others. Each school has its own parent–teacher organization, called a family leadership council, which aims to have a leader from all four communities, and parent meetings are often held early in the morning or in the evening, with childcare and food provided. Still, some parents from Central Falls and Pawtucket have told her that they don’t feel welcome at the meetings and that they don’t understand a lot of what’s happening. Some Cumberland and Lincoln families edge out other voices when they decide to hold events where they want to charge $15 a person, Gonzales explains, and it sometimes is lost on them that such a fee is not feasible for all families. Chiappetta says parent engagement in urban schools tended to be a problem in the past, and he anticipated it would remain a problem. In some ways, though, he says, the BVP model has exacerbated the issue with the more affluent families drowning out other parent voices. Connecting parents tends to be a challenge regardless, he says. Chiappetta has urged schools to organize playdates and spaghetti dinners to bring families from different backgrounds together, an approach successfully employed by other charter schools. For example, Brooklyn’s Community Roots Charter School, another intentionally diverse school, organizes small groups of “Play and Learning Squads” for students and parents to have outings or do cooking and crafts at another family’s home, with the goal of mixing children who would not typically spend time together outside of school.25 Chiappetta has tried to use conversational prompts or starters at school concerts to get parents talking to each other. A recent family night at a YMCA in Lincoln proved successful, but he still struggles to find events that connect families in ways that spur them into setting up their own playdates. BVP’s newest elementary school and middle school have not yet scaled up to reach their full capacity, and the high school is going to graduate its first class at the end of 2018. As the network continues to grow, it continues to grapple with giving school leaders and teachers more autonomy while maintaining its core unifying vision. The different schools also have slightly different student populations, which bring different challenges. For instance, 6 percent of students at one elementary school have disabilities; at another, it is 12 percent. The high school has the largest percentage of such students—nearly 14 percent; it also has the highest percentage of students eligible for free and reduced-price lunch, at about 72 percent. As the network continues to grow, it continues to grapple with giving school leaders and teachers more autonomy while maintaining its core unifying vision. As an intentionally diverse network, Blackstone Valley Prep not only enrolls a racially and socioeconomically diverse student body by design, but also integrates students within the classroom. The results have been positive for the school’s low-income students, who outperform their peers in the four Rhode Island communities from which BVP draws. But the network’s demographics are increasingly skewing low-income, especially in the older grades, often, school leaders worry, due to racial bias among families. The demographic tilt to low-income is a trend that BVP leaders are concerned might continue, though network leaders are hopeful that its new state-of-the-art high school and the successes of its first graduating class will make it more attractive to affluent families. To keep classes integrated, the network has large class sizes with two teachers each, allowing them to differentiate within the room. But there are challenges with the model, especially in having students with behavioral challenges in these large classrooms. The approach has turned off many suburban families, BVP leaders acknowledge. At the high school level, BVP is embracing tech and personalized learning, allowing students to tackle assignments at their own pace. This approach, too, has come under fire, and school officials do worry that it could alienate some students. But Rhode Island as a whole is moving in this direction, and BVP hopes it can provide lessons for the state. In deepening its core mission as a diverse charter network, BVP has developed a culturally responsive curriculum and is fostering diversity among staff, but it is still working to meaningfully connect parents from diverse backgrounds. As the network grows, it has rethought some of its strictest policies: shortening the long day by an hour, reducing the homework load, and moving toward more restorative approaches to discipline. It is also trying to give schools more autonomy—and is hopeful that doing so will help with teacher retention—while remaining true to its unifying vision of itself as a high-performing, integrated charter network. Unless otherwise noted, all quotes are from interviews or observations by the author. “Our Results,” Blackstone Valley Prep website, accessed April, 2018, http://blackstonevalleyprep.org/results/. 2012–2016 American Community Survey 5-Year Estimates, https://factfinder.census.gov/faces/nav/jsf/pages/programs.xhtml?program=acs. “Central Falls Home Prices & Values,” Zillow, accessed April 26, 2018, https://www.zillow.com/central-falls-ri/home-values/. Blackstone Valley Prep internal data, January, 2018. “About Blackstone Valley Prep,” Blackstone Valley Prep website, accessed April 26, 2018, https://blackstonevalleyprep.org/about/. Marcia Green, “Local teen marijuana use among highest in nation,” Valley Breeze, August 12, 2015, http://www.valleybreeze.com/2015-08-12/cumberland-lincoln-area/local-teen-marijuana-use-among-highest-nation. Rhode Island Department of Education data for Blackstone Valley Prep for 2016–17, accessible through http://www.eride.ri.gov/reports/reports.asp. Dana Goldstein, “Integration and the ‘no excuses’ charter school movement,” Washington Post, June 2, 2011. Rhode Island Department of Education PARCC data for 2017, accessed April 26, 2018, https://iss.ride.ri.gov/AssessmentResults. Blackstone Valley Prep website, “Our Elementary Model,” https://blackstonevalleyprep.org/academics/elementary/. Tim Newcomb, “Will Personalized Learning Become the New Normal?,” The Atlantic, March 29, 2017, https://www.theatlantic.com/education/archive/2017/03/will-personalized-learning-become-the-new-normal/521061/. Kate Stringer, “Richard Culatta on How to Do Personalized Learning Well—and Why It Could Be the Key to Narrowing a School’s Equity Gap,” The 74 Million.org, December 6, 2017, https://www.the74million.org/article/74-interview-richard-culatta-on-how-to-do-personalized-learning-well-and-why-it-could-be-the-key-to-narrowing-a-schools-equity-gap/. Benjamin Herold, “The Case(s) Against Personalized Learning,” Education Week, Nov. 7, 2017, https://www.edweek.org/ew/articles/2017/11/08/the-cases-against-personalized-learning.html. Ulrich Boser, “Teacher Diversity Revisited: A new state-by-state analysis,” Center for American Progress, May, 2014, https://cdn.americanprogress.org/wp-content/uploads/2014/05/TeacherDiversity.pdf. Rhode Island Department of Education, Blackstone Valley Prep Elementary 2 School survey 2013–2014, http://infoworks.ride.ri.gov/files/surveyworks/2013-2014/combined/surveyworks-2013-2014-blackstone-valley-prep-elementary-2-school-student-parent-teacher-es.pdf. “Teachers,” Niche.com page for Blackstone Valley Prep, accessed April 26, 2018, https://www.niche.com/k12/blackstone-valley-prep-lincoln-ri/#teachers. Nancy Krause, “3 Blackstone Valley Prep teachers resign after private chats leaked,” WPRI.com, June 22, 2016, http://www.wpri.com/news/local-news/blackstone-valley/blackstone-valley-prep-fires-3-teachers-after-private-chats-leaked/1044401690. Amy Zimmer is an award-winning journalist based in New York. She covered education for the neighborhood news site DNAinfo, and her work has appeared in The New York Times, The Wall Street Journal and City Limits. She wrote a book exploring the social history New York City Transit’s Miss Subways contest, one of the nation’s first integrated beauty contests, and organized an exhibition on the topic at the New York City Transit Museum. She is currently head of content strategy for Localize.city. Amy received her bachelor’s degree in anthropology from Yale University and has a master’s degree in journalism from New York University.